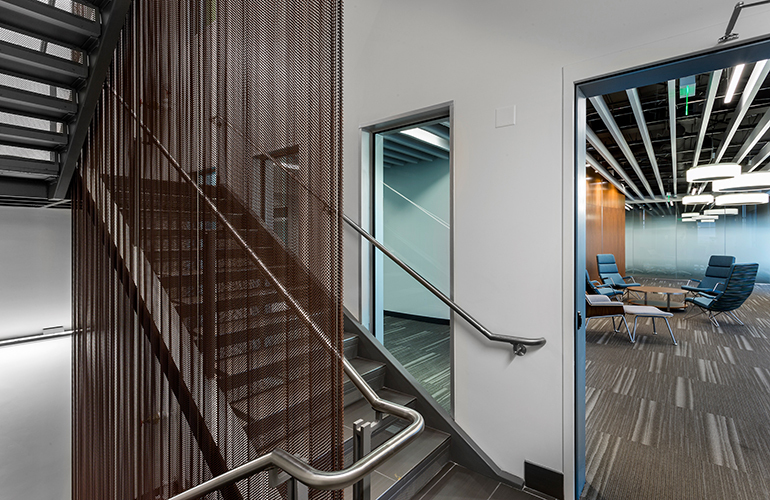 For VGM Group's Iowa headquarters, Cascade Architectural's Fabricoil® coiled wire fabric was used to encase the open elevator shaft, as well as provide fall protection via railing infill for the stairwells. Kate Payne and the team of architects at INVISION specified Fabricoil because they needed a durable, metal material with a “curtainy” look. VGM Headquarters features a total of 3,582 sq. ft. of 5/16”-15 ga. aluminum Fabricoil with an antique copper finish. The coiled wire fabric perfectly complements the building’s interior by providing a truly unique and visually appealing design component.